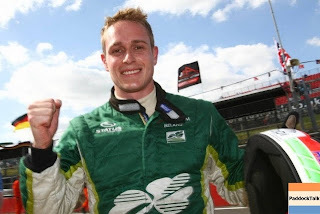 I must admit I know very little about the racer Adam Carroll of Northern Ireland... Although I’m impressed by his CV and enjoyed just listening to him via Don Kay’s ‘lil radio show (Autosport Radio) this past Tuesday night... Even if he sounds a wee bit overly serious, he did seem to have a pretty quick wit about him and I’m guessing I wouldn’t want to be in a room with him, Will Power ‘N Paul Tracy... Since the jokes would definitely be on Mwah, eh? Yet I find Carroll’s demeanor ‘N persona to be refreshing... Telling Don He just stays in his own truck on weekends when asked what it’s like being teammates with ‘DannaWho?